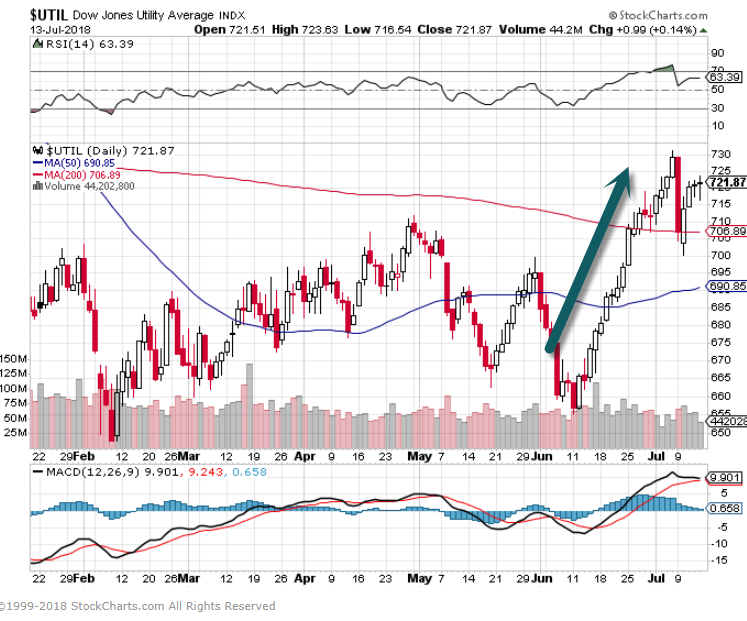 1.10 Year Back Below 3%…Utilities Gain 2% Per Week for a Month Straight. Utility stocks in the S&P 500 have made gains of at least 2% in four straight weeks, a first for that sector. The previous record was three consecutive weeks in 2000 and 2004. 2.Income Seeking Investors Back in Utilities….But Risk On Remains-Biotech New Highs Silver New Lows. 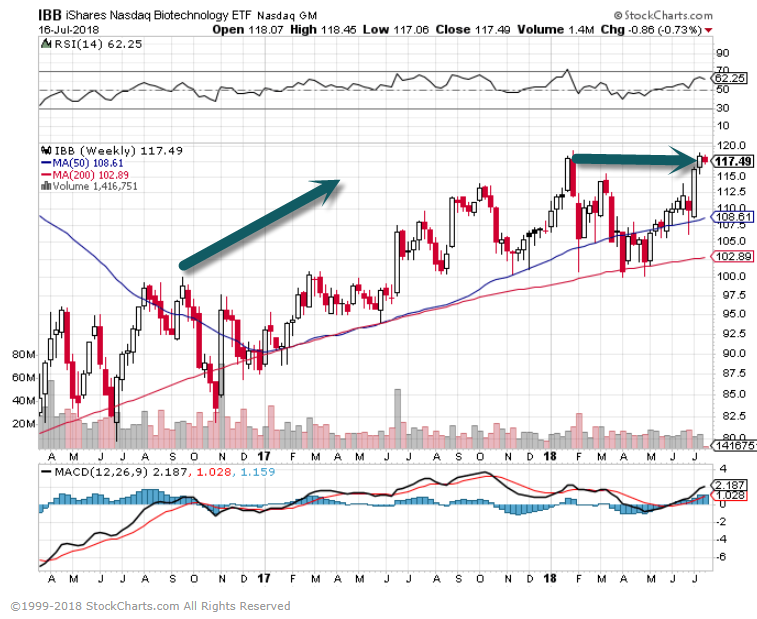 IBB Biotech ETF New Highs. 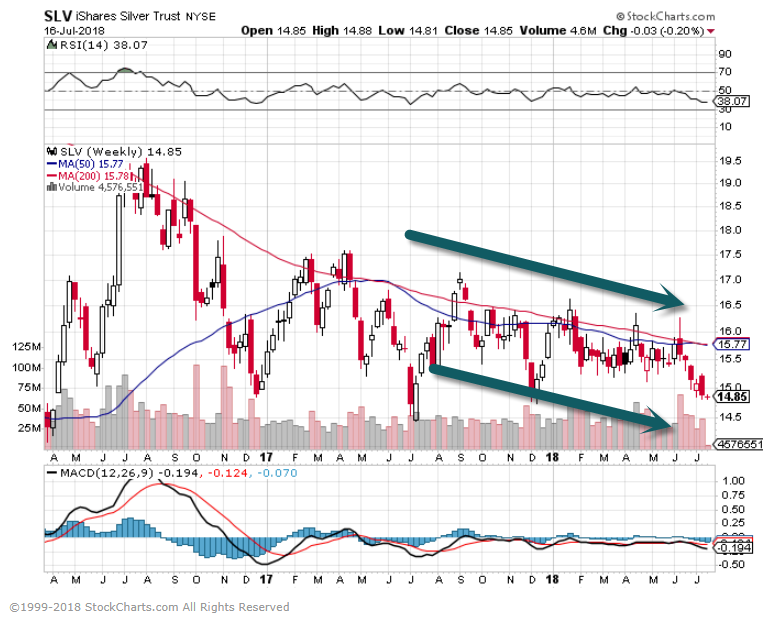 3.Silver New Lows Related to Dollar Strength….2nd Half Will Be All About the Dollar. Read full story at Blackrock Blog. 4.U.S. 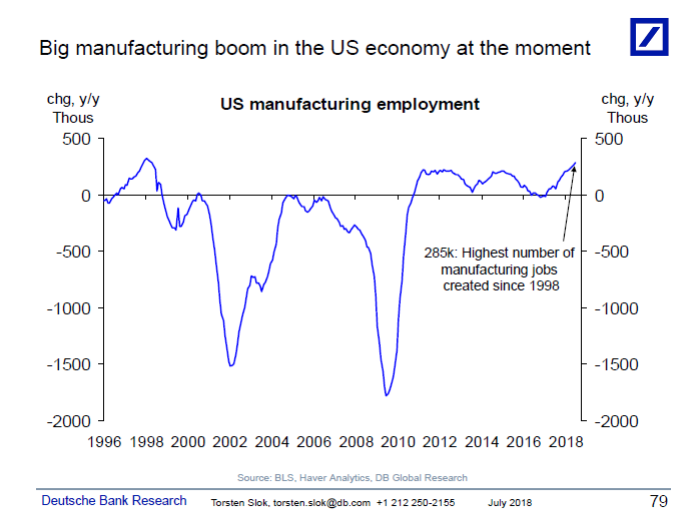 Manufacturing at Highest Levels Since 1998….Maintaining that Status will Depend on Dollar Action. Let’s spend less time looking at the yield curve and more time looking at the economic data. Everyone who talks about late cycle and a recession coming soon should take a look at this chart. The US economy is producing the highest number of jobs in the manufacturing sector since 1998. This confirms the overarching investment theme across all asset classes today: The risks of overheating and overshooting inflation are much higher than the risks of a recession. In fact, this is the entire reason the Fed is so keen on raising rates a lot more from current levels. For more see also here. 5.Valuation Spreads…U.S. vs. International ….Also About the Dollar. There’s another important point to consider, again demonstrating that prices already reflect what is knowable. The following table shows the current valuations for U.S., developed market and emerging market stocks. Clearly, U.S. stocks’ higher valuations reflect the view that, in the collective wisdom of investors, the stocks of other developed nations are riskier and the stocks of emerging market countries are riskier still. Because current valuations offer the best estimate of future returns, investors seeking the safety of U.S. stocks are accepting lower expected returns. Of course, that doesn’t mean the higher expected returns of international developed markets and emerging markets makes them superior investments, just riskier ones for which investors require that higher expected returns as compensation for assuming incremental risk. 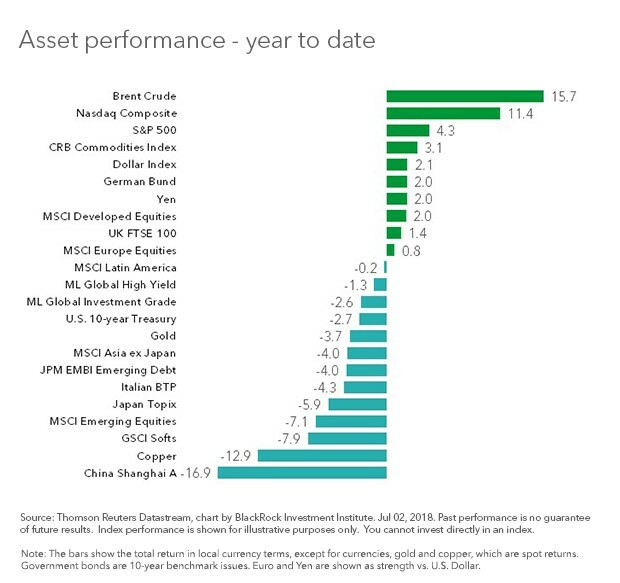 The data is from Morningstar, with portfolio information as of the end of May 2018. Using a selection of funds from Dimensional, we see the same thing when we look at value stocks. In particular, note that emerging market value stocks are trading at about one-half the P/E ratio of stocks in the S&P 500 Index. International small-cap value stocks and emerging market stocks are trading at below book value while stocks in the S&P 500 Index are trading at almost three times book value. That spread reflects the difference in views regarding their relative safety. 6.Follow up to Yesterday’s Capex Chart. US companies don’t look constrained by funding limitations. Our research shows that the top 25 US nonfinancial large-cap companies deployed more cash toward share buybacks and dividend payouts combined than on capital expenditures in 2017 (Display). 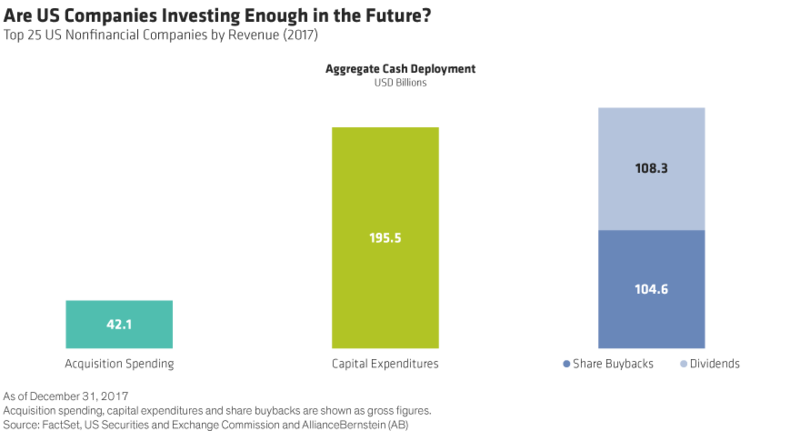 If funding is available, what keeps companies from spending more? Many companies don’t have enough good ideas to fund, while others lack vision. Bureaucratic governance structures may also hinder timely investment. Of course, tax reform could spur companies to launch new investment initiatives. However, many companies strive to grow earnings annually, which can also influence how they prioritize capital allocation and detract from their ability to sustain future profitability. In our view, many companies might be choosing not to fund good ideas because it’s simply easier to buy back stock, which flatters short-term EPS growth rates. What’s wrong with that? The challenge is that maintaining high profitability often requires an intelligent trade-off between managing expenses while funding business model improvements and future growth opportunities. Sustained investment is always vital to future shareholder value creation—especially in a world that’s rife with technological disruption. That’s why we believe investors should scrutinize companies for signs of underinvesting. Companies that underinvest might look healthy today, but their high margins may mask an underlying weakness: a lack of readiness for looming threats to a business model. 7.After Outperforming the S&P for Entire Bull Market…PKW Buyback ETF Trails YTD and 1 Yr.
8.Iranian Citizens Prefer Restarting Nuclear Program. 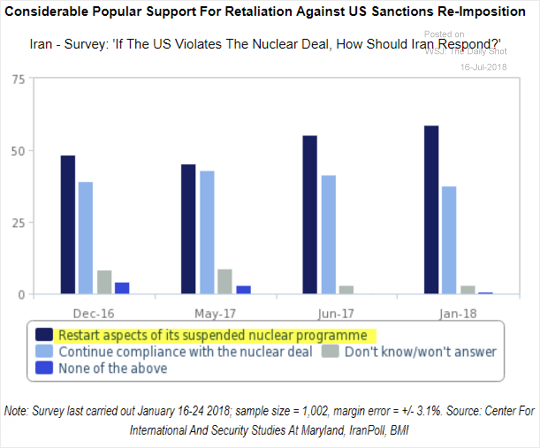 Food for Thought: The majority of Iranians prefer restarting the nuclear program. A single bout of aerobic exercise can improve brain efficiency and connectivity. For the first time, a new study from McGill University reports that a single fifteen-minute bout of cardiovascular exercise can optimize brain connectivity and efficiency. More specifically, the researchers found that 15 minutes of aerobic exercise on a stationary bicycle immediately after a practicing a complex visuomotor skill created an optimal brain state for long-term memory consolidation of the task. The findings of this study were recently published in the journal NeuroImage. Other research on the link between aerobic exercise and memory consolidation conducted by Roig has demonstrated that cardiovascular exercise also helps to consolidate implicit motor skill memories if and when the 15-minute aerobic workout is performed soon after practicing a specific motor skill. For the latest McGill-based research on the correlation between memory consolidation and a single 15-minute bout of aerobic exercise, first author Fabien Del Maso collaborated with Roig to examine what was going on in the brain during this process. To test differences in brain activity during motor task learning either with or without subsequent aerobic exercise, the researchers had study participants play a “pinch test” video game that involved gripping a dynamometer with varying degrees of intensity to accurately move a cursor around the computer screen while being monitored using electroencephalography (EEG) and electromyography (EMG). Immediately after the initial “pinch test” practice session, participants either rode a stationary bicycle for 15 minutes or sat still. Then, participants were asked to perform the hand-grip task again at 30, 60 and 90-minute intervals as the researchers assessed brain activity. The next phase of testing occurred 8 hours after the initial motor skill learning and again 24-hours later as the researchers monitored changes in brain activity, efficiency, and connectivity. Notably, study participants who had performed 15 minutes of aerobic exercise after learning the dynamometer hand-grip skill were able to perform the complex “pinch task” using fewer brain resources and with better interhemispheric efficiency 24 hours after initially learning the task. When the researchers analyzed the brain data to unearth differentiating factors between the “exercise” and “non-exercise” groups, they found that neural connections between and within brain hemispheres had become more efficient in those who worked out for 15 minutes after initial motor skill learning had occurred. “Because the neural activation in the brains of those who had exercised was much lower, the neural resources could then be put to other tasks. Exercise may help free up part of your brain to do other things,” Fabien Dal Maso said in a statement. A particularly intriguing aspect of this study is that 8 hours after learning a new motor skill there was relatively little difference in skill retention between the exercise and non-exercise groups. However, after 24 hours had passed, and both groups had the chance to sleep, the exercise group showed robust improvement in the “pinch task” while using fewer brain resources. One thing that makes the latest 2018 study from McGill unique and potentially groundbreaking is that these findings could help fine-tune a practical prescriptive for how and when a specific dose of aerobic exercise creates an optimal brain state for memory consolidation. The latest neuroscience-based research suggests that 15 minutes of aerobic exercise soon after practicing a new motor skill—followed by a good night’s sleep—may be ideal for promoting functional changes in the brain that facilitate optimal motor memory consolidation. This discovery has the potential to help patients who have suffered a stroke or anyone facing mobility issues after an injury speed up his or her recovery of everyday motor skills. What drew and kept talent yesterday isn’t the same as today. But you can start a new trend of employee loyalty by following these three tips. Guidance is needed now more than ever on how to attract superstar talent and keep them from bolting. Gallup research now indicates that an astonishing 51 percent of employees are looking for another job–an all-time high. So maybe those long employee lunches aren’t just because Chipotle was packed. New research from talent attraction and retention thought leaders, LinkedIn, reveals just what it takes in today’s workplace to win The Great Talent Wars. Gone are the days where writing big bonus checks and primping up salary was enough. Today’s workforce is more demanding–and what they’re looking for may surprise you. The underlying theme from the research centered on the importance that leaders must place on creating a positive workplace culture. 70 percent of professionals said they would not work at a leading company if they had to tolerate a toxic workplace culture. 65 percent said they’d rather put up with lower pay. It’s not just employee well-being, it’s whole well-being. Well-being is being defined by employees more holistically than ever before. In addition to a strong benefits package, employees crave an environment where they feel they can bring their whole selves to work and that work blends with their whole lives. This is reflected in the top three factors for generating workplace pride according to the study. 51 percent of respondents said they were proudest to work at a company that promotes flexibility, 47 percent want to be able to be themselves at work and 46 percent want to have a positive impact on society through their work. In addition to enabling these things as a leader, you can engage in other low-hanging fruit opportunities as well. For example, you can simply inquire about employee’s well-being, role model healthy behaviors (like not visibly working excessive hours as the boss), or become more self-aware of how your behavior stresses employees out (and then moderate it). It’s now clear that more and more of today’s workforce view their jobs not as a paycheck, but as a soul-check. They want work to be a place that’s congruent with who they are, not just tolerant of who they are. An astonishing 71 percent of professionals said they’d be willing to take a pay cut if it meant they could work at a place that had a mission they believed in and a clear system of values congruent with their own. So be clear on your company’s values. Communicate those values frequently. In doing research for Find the Fire I toured more than one company HQ with the CEO who was eager to point out where the company values were literally painted on the walls (companies, by the way, that rated as “Top Places to Work”). Such communication makes it easy for employees to connect their own personal values with those of the company. And never underestimate the importance of values to the individual. After all, values are those little things we do each and every day that exemplifies who we are. They are the little daily impressions we leave that add up to a huge permanent impression. And we have a choice each and every day to live in support of, or in spite of, our values. Foster the former in your employees. It surprised me that the number one factor that keeps employees at a job for five years or more was whether or not that employee experienced a sense of belongingness (“working in a place they feel they can be themselves at”). Perhaps I shouldn’t be so surprised when considering neuroscience research. It turns out that the deep-seated need we have for a sense of belongingness is managed by the same exact neural networks that are used for primary survival needs such as food and water. That’s how fundamental the need for belonging is to a person (and employee). As stated in the LinkedIn study, “Cultivating an environment where all employees feel like they belong is the secret weapon for retention”. As a leader, it takes an intentional approach. Create opportunities for employees to form social bonds. Excel at showing gratitude and establish effective mentor programs. Work hard at showing others they’re valued and craft a sense of shared history or help employees to identify with relevant company history. Create a sense of pride in the company. What kept your mom or dad at their company isn’t exactly the same as what attracts and retains today’s workforce. But with careful planning and diligence, your workplace can soon feel like a family, too.